This is such an easy quilt patch to construct using rotary cutter and sewing machine. In fact so easy, several can be constructed in no time! Two dark fabrics and one light floral fabric need to be selected for each block, as described in the May edition of The Template, page 24. Please bring your blocks to the Saturday August 17 Burwood meeting, alternatively please mail completed blocks to reach the Guild Office before Tuesday 13 August 2013. This Friday, August 2nd, there will be 2 member quilters presenting their creative journey to the Guild. Along with Glen Waples, we will be hearing from long time quilter Marilyn Bell. Detail, Kim McLean Designed : "Flower Pots"
As is often the case, it became her youngest child's entrance to school that allowed Marilyn the time to embark upon learning this craft, more than 20 years ago. Experimenting with the many types of patchwork available in local Northern Beaches classes, resulted in Marilyn being eventually drawn to Hand Applique in 'modern brights' as her "go-to" choice for creativity. Come along to the Guild Office this Friday to see the beautifully hand finished quilts from both Marilyn and Glen. Members are advised that the next scheduled Friday Showcase will highlight the quilting lives of two fellow members : Glen Waples and Marilyn Bell. This now twenty year obsession has culminated in Glen becoming a Prize Winning Quilter. Her current quilts are often based upon antique quilts and coverlets, with Glen tweaking the design elements to make them her own. We look forward to seeing her many quilts during the August Showcase. A visit to the Library at the Guild's Office will ensure books of further quilting inspiration will promptly make their journey back to your home. Above are just a small selection of recent acquisitions to the extensive library. Two other recent arrivals to the shelves are Publications by Studio Art Quilt Associates, Inc. These additions have been kindly donated by Lisa Walton. The Guild Library also has numerous interesting magazines for loan. Down Under Quilts is always available for loan, and, Patchwork tsushin (whilst written in Japanese) is a visual delight showcasing innovative Modern Japanese quilts. The Guild Librarian is Rhonda Taylor and she is to be thanked for always procuring fascinating new publications, which cover a wide variety of interest and technique for the quilting enthusiast and quilt history lover. Pam Curtis' July Friday Showcase proved as popular as expected, with over 30 members gathered in the Guild Office. This quilter always has "hexies on the go", which is probably the only way to achieve such a large body of handpieced work. No moment has been left idle . . and thus Pam has produced a gorgeous array of handpieced and hand quilted traditional styled quilts . . . along with numerous "flimsies" still awaiting the quilt construction. This Showcase was a feast for the eyes and much murmuring over the extraordinary workmanship was noted! Thankyou Pam, for sharing your quilting story. No time to put your feet up after the recent successful Sydney Quilt Show, as there are just eight weeks until the next Guild Challenge is due. 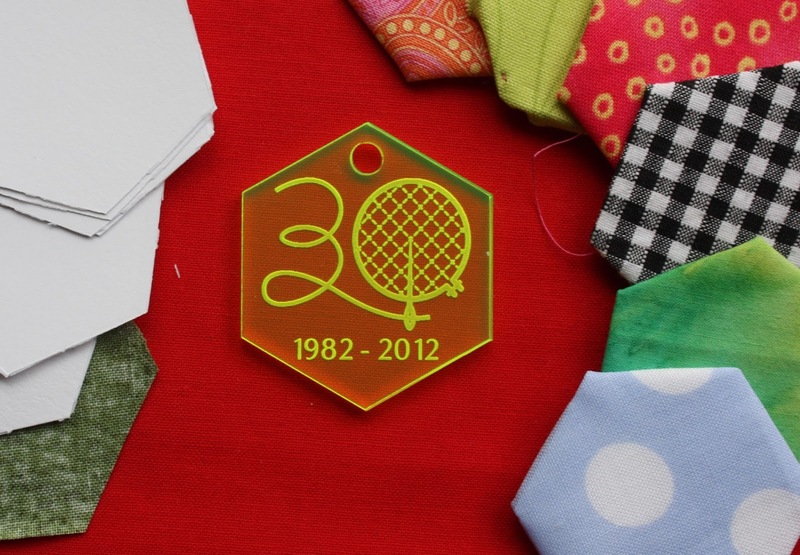 All Guild members will have received the commemorative hexagon key tag as part of the 30th Anniversary fun and this is to be used to make a quilt of any design or colour. Further details may be read in the recent May Template. Entry Forms will be on the Website soon and in the August edition of The Template.